At Dharf.com we design what we love, for who we love. Our trendsetting designs celebrate the smart and quirky personalities of our customers and their four legged friends that are sure to spur curiosity and admiration from passers-by. Our innovative approach to our designs integrate style with comfort and practicality. 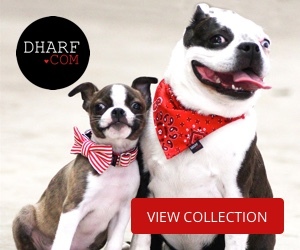 There’s something for every cool cat or dog at Dharf, whether it be a collar, harness, leash, bowtie, bandana, jackets, coats - we have it all! Unique, stylish, quality products with the wow factor - your pet is sure to start turning heads in the street!